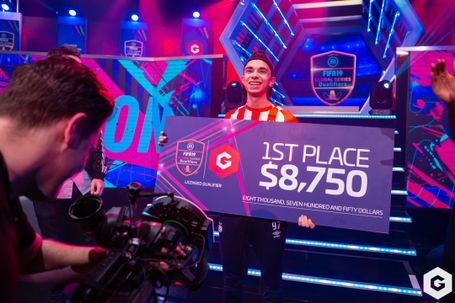 Belgian Stefano ‘PSV Pinna97’ Pinna’s success makes it back-to-back triumphs for PS4 players in the Gfinity FIFA Series. 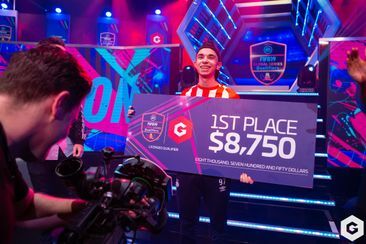 After failing in three cross-console finals over the past 12 months, Stefano ‘PSV Pinna97’ Pinna finally picked up a Grand Final victory in the Gfinity FIFA Series February. After a ropey day of qualifying, the Belgian brought his A game on Championship Sunday, ripping through the knockout stages to take the $8,750 prize and 750 Global Series rankings points. The PSV Eindhoven player met Michael ‘MegaBit’ Bittner in the cross-console final, with his German opponent making a first Grand Final since the Global Series playoffs on FIFA 18. MegaBit had seen off number one player Donovan ‘F2Tekkz’ Hunt earlier in the day, but was sluggish out the blocks against Pinna, losing the first leg 3-1 on his preferred Xbox One console. MegaBit had the bit between his teeth in the second leg, fighting back to level the aggregate scores at 3-3 to force extra time. Both men scored in the added period, taking the game penalties. MegaBit missed his first penalty, opening the door to Pinna, who was perfect from the spot to take his first overall championship win. So PSV Pinna97 claimed the title, and here’s the recap from the rest of the knockout rounds. In the tightest contest we saw in the knockout rounds, PSV Pinna97 edged out Vfb DrErhano in a 2-0 aggregate victory to take the PS4 title. Goals from Ruud Gullit and Lionel Messi in each leg got the PSV man the win, with DrErhano knocking at the door again and again in the second leg, but Pina’s defence managed to hold out and book his place in the grand final. PSV Pinna97 was gaining momentum, and he put on a clinic against Agit ‘Agit-_-Power’ Katilmis. Despite having less possession and the same amount of shots, the Belgian won 9-0 across the two legs, with four goals from Lionel Messi, three from Cristiano Ronaldo and a brace from Kylian Mbappe. A big upset came in the matchup between Erhan ‘Vfb DrErhano’ Kayman and Nicolas ‘Nicolas99fc’ Villalba, with the German knocking out the highest ranked PS4 in the world and reigning Gfinity LQE champion. After a tentative 2-2 draw in the first leg, DrErhano stole a 2-1 victory in the second leg with two Cristiano Ronaldo goals, weathering a barrage of shots from a raging Nicolas. In a cagey semi-final clas, it was PSG DaXe who just managed to get over the line. The Frenchman took control of the first leg with a 2-0 victory, but there were some nervy moments in the second game as a 2-1 win for Killan ‘Zidane_10’ Ossorio wasn’t enough to overturn the deficit. A huge shock as MegaBit picked up a first tournament victory over F2Tekkz. Tekkz was concerned about the German despite a 4-0 record against him, and the Englishman had one foot in the console final with a 2-0 lead after the first leg. The German came back fighting however, with four goals from Cristiano Ronaldo as well as a strike from N’Golo Kante giving him a shock 6-4 aggregate victory. 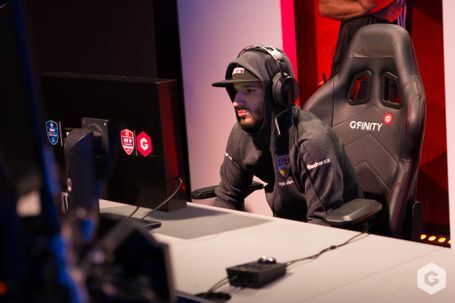 The PlayStation quarter-finals went as expected, with PSV Pinna97 putting an end to Simon ‘Roma Zimme’ Nystedt’s unbeaten run at the Gfinity Arena. VfbDrErhano racked up the goals, coming from behind to defeat Daniel ‘DanielAguilar4’ Aguilar 6-3 with two goals from Neymar. Elsewhere, Nicolas99fc got Championship Sunday off to a great start with a 5-2 victory over TG Zezinho23, whilst Christopher ‘NYC-Chris’ Holly defeated Agit-_-Power 4-2. The goals were flying in during the Xbox One quarter-finals, but all eyes understandably were on F2Tekkz. The Global Series leader put Lukas ‘Sakul’ Vonderheride to the sword with a crushing 9-1 aggregate victory, with Kylian Mbappe scoring four in the first leg alone, before a 25-yard flick over & volley from his idol Steven Gerrard sealed a resounding victory. MegaBit showed he was a contender early one, and he took Josaci ‘SPQR Senna’ Santana de Sena Filho apart with an 8-3 victory. Zidane 10 kept his run going with a 6-3 win over Leon ‘blackarrow889’ Hagen Ausieker, and PSG DaXe kept his name in the hat, seeing off Fabio ‘ALKES Denuzzo’ Denuzzo 4-3. Stay tuned for more FIFA 19 news and events coming soon!